The UK Wig School is a private school birthed by the Tutor and Director Ms Rosa. 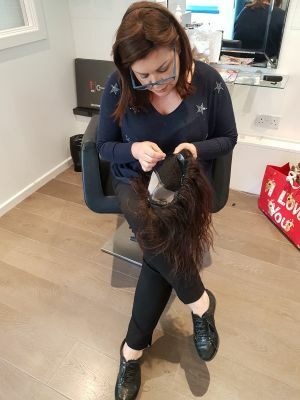 Being a hair loss sufferer from the age of 12, becoming a Specialist & Master Wigmaker as well as perfecting the art of Wig Making is a subject of utmost importance to her. The Tutor is a City&Guilds qualified Tutor and Wig Maker, in addition to being the President of the Spanish Association of Wigmakers. (www.asociaciondeposticeria.es), and the Chief Executor of Tricho Alopecia Solutions in London. 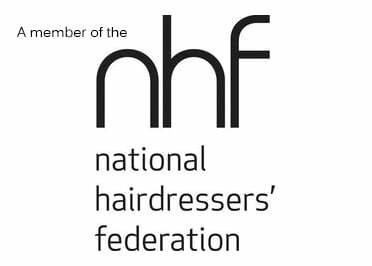 Furthermore our Tutor is member of both the National Hairdressing federation and Habia. 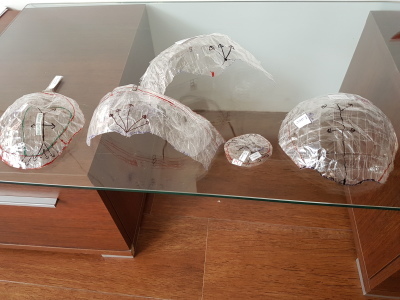 The tutor has, for many years, traveled the world and worked in China in order to research all aspects of wig making, to not only enhance her own experience, but also be able to pass this information on in order to widespread the Wig Making skill. Rosa has more than 25 years of experience when it comes to dealing with all kinds of hair replacement. 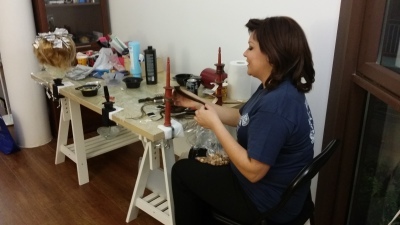 She too, holds certificates in several courses for braiding, weaving and extensions, making her a specialist in over 17 different techniques. In addition to that she is a beauty specialist (ITEC) which is an internationally recognised honor. Rosa graduated as an Anatomy and Pathology T.Nurse in 1997. 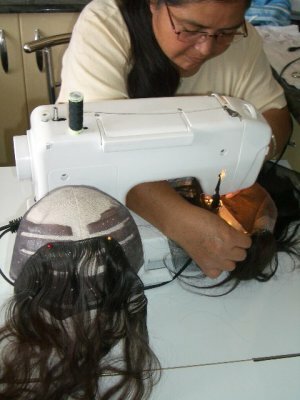 Rosa is directly responsible for upgrading the standards of the wig making industry by developing her own teaching style and course outline, brushing away from the syllabus techniques that are basic and obsolete. 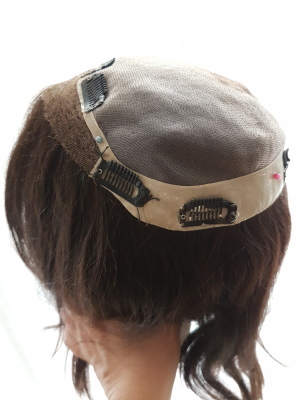 This has led to Rosa's long standing authoritative figure within the Wigmaking industry and she stands as a Veteran of Hair replacement systems worldwide! Many teaching academies still teach outdated syllabuses within their program instead of including the very new technologies that are implemented in the new modern industry. Some even try to replicate the advanced syllabus created by Ms Rosa but simply do not have the knowledge or experience of it to do so. 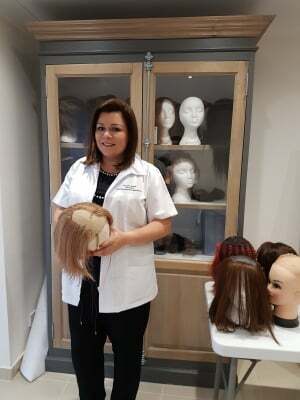 While the UK Wig School shares some common principles with many teaching academies like City&Guilds, the Tutor includes her own first hand knowledge, progressive course structure, the latest technology, and her priceless experience to ensure that the course is as detailed and knowledgeable as possible. 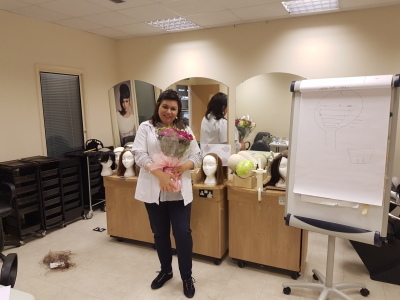 Working in conjunction with other Wigmakers, factories, stylists, developers and other teachers, Rosa has developed a wide array of skills which she has implemented into her teaching. Rosa is Spanish born and has been livng in London since 1996. She is continuously researching, travelling, promoting her business and collecting the best and finest hairs available from all over the world. 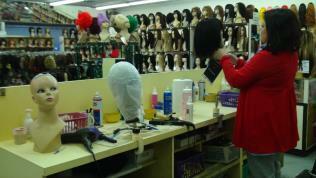 Her interest for wigmaking started from her own personal experience of hair loss. 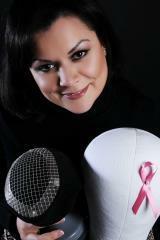 At the age of 12 Rosa was diagnosed with Alopecia. 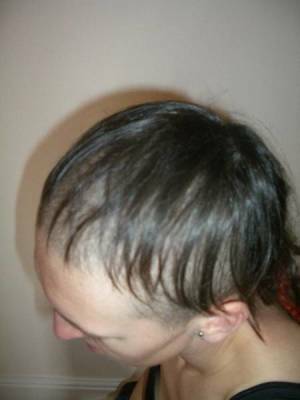 Seeing what little options there were for those with Alopecia spurred her to start researching into different techniques and types of hair replacement. A few years later Rosa began travelling the world, trying to develop solutions for herself and later went on to qualify in the above subjects from City & Guilds. Rosa also mastered many of the Afro Caribbean hair extension techniques in order to supply demand and solutions to a wide market. 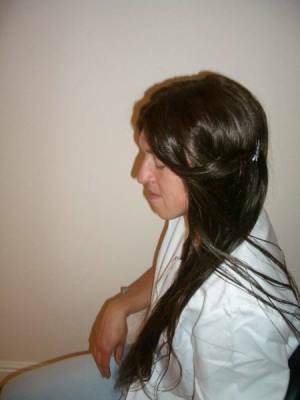 Rosa's City & Guilds qualification to teach adults has enabled her to develop her own unique fast track wig making programme. "When I could not find a real undetectable good quality volumizer in London without being forced to pay extortionate prices for bad quality hair, I left the continent for 4 months. During this time I lived and worked for small and large factories in Asia and the far east, searching for the very best hairs and to try and find the secret to success and trust behind this billion dollar market" - Rosa. Rosa set up her business in wigmaking & hair replacement when she discovered how rewarding it was to make people feel better about themselves and by restoring their image and identity through this magnificent and forgotten skill. Rosa to this day still travels worldwide firmly believing that "it has to be me, personally who hand picks the hairs I use for my clients and no one else". Learn one of the best kept secrets and one of the most soul rewarding skills in the world. 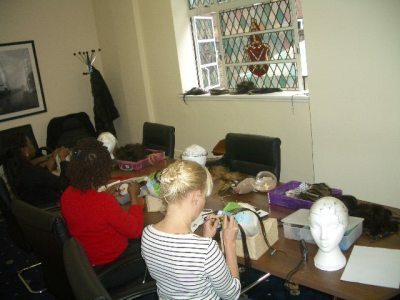 Become a wigmaker with this 90% practical hands on course which is full of technical skills and real world experience. 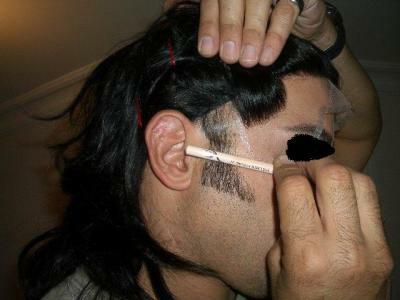 You will also be working with the latest state of the art materials and lace used in wig making. 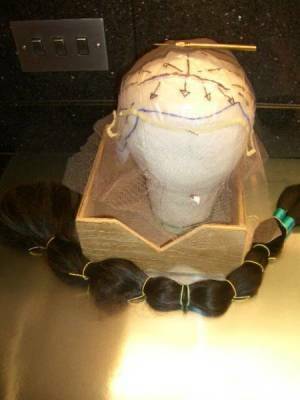 Make wigs that you could sell at a cost from £1,000.00 to £7,000.00. No secrets or information will be kept from you during this course, everything you have ever wanted or needed to know will be disclosed to you in a small group or private class. All secrets of the trade, list of suppliers, how to make correct orders and a module on marketing will also be included within the Lace Wig & Hair Replacement Course. The economic crisis may still be upon us, however during the first & second world war, ladies would still style their hair and attempt to look as glamorous as always as if it was the greatest time of their lives. Why you ask? Because a woman's hair represents a big part of their sexuality and identity. Most of us would prefer to endure many other things over having a bad hair day. It's been like this for centuries and continues to be the case today! If you focus on success and how to make hundreds of people happy through your expertise, positiveness and honest conduct, combined with a good professional level; upon finishing the course, nothing should stop you from becoming one of the most successful entrepreneurs in your city. Success derives from how you choose to spend your free time, whether you are at home are or in a full time career. By being a hair replacement expert, you will be helping others and choosing where you want to work. Hair industry generates billions, more than other multinational industries. But if you are reading about our courses then you probably already know this. 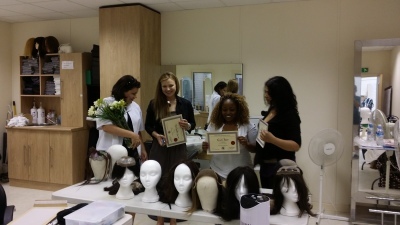 Our course will aim to make you sucessful and teach you about hair and the quality of workmanship.